Merrell is one of the worlds premium active shoe labels with a range of products suitable for streetwear through to tramping through the Patagonian wilds. The client asked us to concept a catalogue linked to travel, both local and overseas. We chose locations based on the shoe styles and appropriate activities and wrote stories to help the customer dream. When the client's ability to provide travel images fell through we even sourced an alternative supplier and negotiated the terms of image usage. 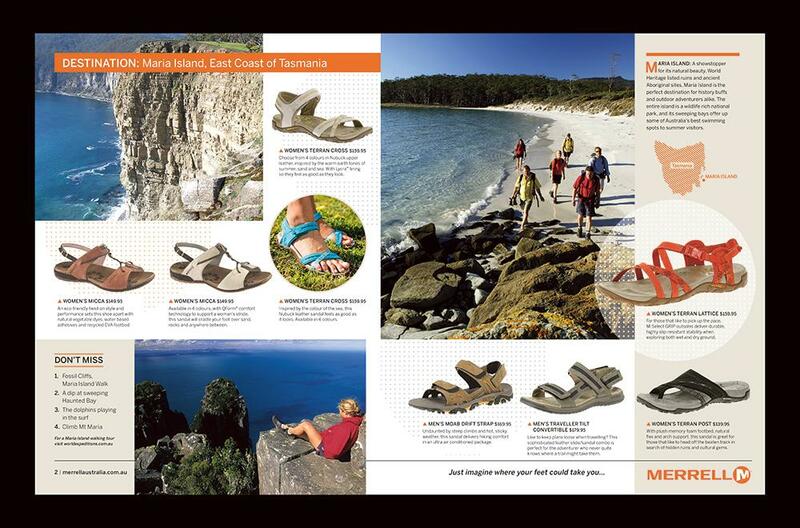 The catalogue certainly drove traffic - one 80 year-old country Victorian lady who had never before heard of Merrell drove over 200kms on the Monday morning after release to visit a Melbourne store and see a product!